On the heels of the success of their debut EP, GENTRI is releasing a special three-song Christmas EP. 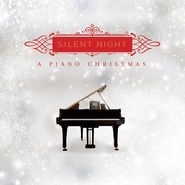 Their signature style shines on these gorgeous arrangements of the Christmas classics "Silent Night," "Ave Maria," and a unique medley of "What Child Is This?" and "I Wonder as I Wander." In late 2014 they introduced their group to an audience of over 8,000 at the Maverik Center in Salt Lake City and received a standing ovation after their debut performance of "Silent Night." Their soaring vocals and tight harmonies bring the true spirit of Christmas with this breathtaking Christmas album. The Gentlemen Trio, was established in June 2014 and is comprised of three highly trained tenors: Brad Robins, Casey Elliott, and Bradley Quinn Lever. Their self-titled debut album was released in March 2015 and spent nine consecutive weeks in the top ten on two different Billboard charts. On the heels of their album release, the Gents debuted their music video for their original single “Dare,” which made international headlines on news outlets around the world including ABC World News, NBC Nightly News , and Inside Edition.